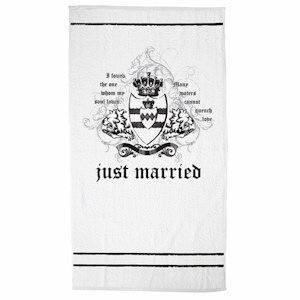 The Just Married White Beach Towel is a fun accessory to send the bride and groom off on their honeymoon with. It's done in a soft and plush cotton. At a full 54" x 28", it's just perfect for the newlyweds for their honeymoon on the beach. 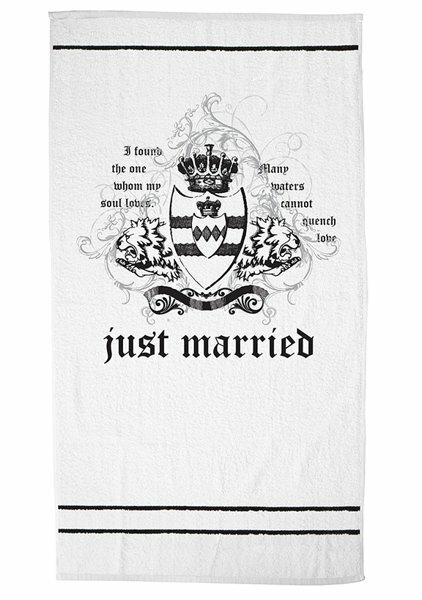 The black and white art on the towel features a hip and modern styling including vines, banner, lions, a shield, a crown, and the words "Just Married." It also has a sweet sentiment, "I have found the one whom my soul loves." It's a cute idea for the wedding party to give to the couple. Even if they're not escaping to a shoreline hideaway, they can still use it all the time at home.